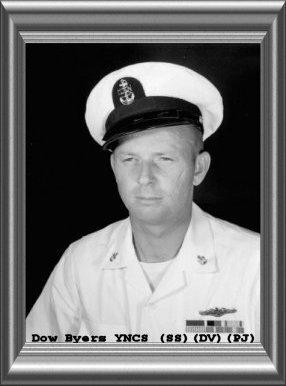 USNavy SEAL Dow Byers YNCS Rest in Peace Dow Byers YNCS(SEAL)(SS); Memorial, SEAL, UDT, Diver, by Erasmo Riojas "Doc Rio"
In 1990, Lourdes, Mandy (our granddaughter) and I were attending Rudy Boesch�s retirement ceremony. Then off to visit the RAT (Mickey Mouse) in Orlando, Fl and at that time we stopped in to visit Dow Byers in Brooksville, Fl. Dow looked ever so dapper in his fashion statement of plain shorts, white t-shirt and a scruffy beard. He was happy and spending all of his time tending to his horses, painting on the ranch which he shared with his wife Annice. He had many talents and was always using them to keep himself busy. If he had no canvas he�d paint on a cardboard box. If he had no wood he�d tear something down and used whatever wood he could salvage to create a new master piece. He�d go river rock hunting to build a wall for his property. He even would pick up cans on the side of the road for something to do, before recycling was popular. We talked about old times at the UWSS and at Little Creek, Va. Dow had retired from the U.S. Navy and from Old Dominion University Police Department, where he had his second successful career as Chief of Police. He employed many retire SEALs and team-mates to work for him. They kept the University students safe and sound as he did his country. He was the President of the FO of UDT / SEAL for many years. He made plaques for all the teams in his garage, which was always his office of choose and rode his Harley Davidson Electra Glide year round. Then the word came that Dow had passed from an aneurism. He was found by his grand-children after his fatal CVS. John Francis Rabbit and I went down to Brooksville to bury one of our dearest friends and teammates. Only to find out there would be no service, but we did have one hell of a good wake for him at his ranch. CPO? sorry his name escapes me, but he worked with Dow at ODU. Dow also had a younger sister Mary Jean Berner, her husband Alfred and a niece Allison that were unable to attend. His sister Mary was attending to their mother in Good Thunder, Mn. Dow was loved by many and will be missed by everyone whom he touched in his life. He was a loving father and husband and one hell of a good friend. He was always a man of few words, but a man of wisdom and many talents. He had a smile that would warm your heart and a hug that would engulf you.